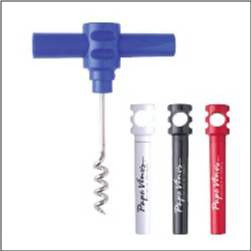 Order Custom Wine Cork Screw Openers – these are very popular imprinted logo items to promote your wine, winery, distillery, vineyard, wine events, tastings, liquor store, and more. These convenient openers come in a safety tube that is also the handle when turning. Approx. 4.5 inches long. Come in Black, Blue, Red, White. 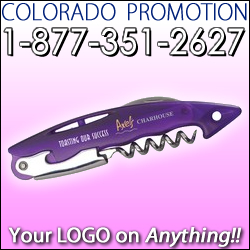 A very popular Wine promotional item for trade shows! 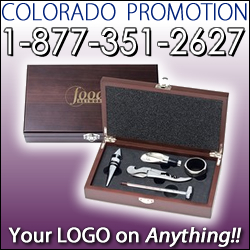 Colorado Promotion is your connection for custom wine giveaways, wine imprinted accessories, wine marketing products, and more. This wonderful set includes a mahogany finish wooden box with latch, and comes with a collar, bottle stopper, pourer, corkscrew, and thermometer. 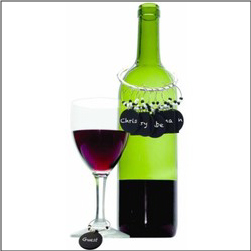 Makes a wonderful high-end wine event gift or winery promotion. 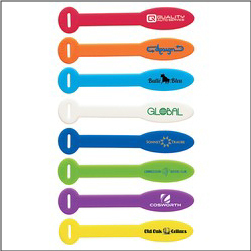 No Wine event should be complete without a collection of these handy wine openers to handout and giveaway (or even sell). These Sonoma Wine Openers are a sleek contemporary design, perfect for tastings, food events, and almost any food and wine occasion. Includes foil cutter blade and a very sturdy corkscrew with lever. Also great to promote liquor stores, restaurants, and more.